Molli Sparkles is making quilts for the families of the victims of the Sydney siege last week. He shared the tutorial for this block and will make several rainbow hashtag quilts from all the blocks sent in. These are the blocks that I have made and are on their long journey off to Australia. They have all been sent to help the Australian Outback Baby Project. How do superheros carry their toys around? Why in a superhero back carrier of course! 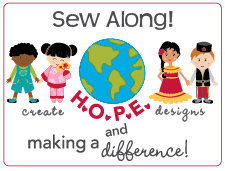 I’m taking part in the September Sew Along with Create H.O.P.E Designs. CHD sells a wide selection of patterns for $5 each, with all money raised going to charity. I chose the AVIVI Doll carrier pattern, as W had commented not so long ago about wanting a piggyback carrier just like the one Mummy uses for him (I have an Ergo). He has been wearing his superhero t-shirts and capes as often as he can recently, and playing with the superhero toy I made him for Christmas, so a superhero carrier was just the thing he needed! The front of the carrier is made from the same superhero flannel as his doll is made from … … and the inside is leftover black drill from his suit jacket and trousers. There is a heart shaped harness on the inside to hold the toy in. The straps are elastic with velcro to fasten them. Superhero doll has already been for a trip out in his new carrier, and I’m told he really enjoyed it! The Dolly Drive finished this weekend, and the final tally will go up on Tuesday (due to the Easter holiday weekend when there’s no post). But we already know that the target of 1000 toys has been exceeded, so that’s over 1000 poorly children around the country who’ll receive a gift to help brighten their days in hospital – isn’t that wonderful. I made one more item to send in the last week of the Dolly Drive. A bedtime baby doll from the Funky Friends Factory pattern that Pauline kindly offered for free to those who wished to use it to make toys for the drive. I made it using some dinosaur flannelette and pink cotton. I used the photo tutorial on the FFF website to follow the pattern which was really helpful. In the three months from January to March the Dolly Drive is hoping to collect 1000 handmade soft toys to distribute to children’s hospitals around Australia. These are my contribution to their collection. They are Mushroom Rattles, made from a Dolls and Daydreams pattern. They have two little bells in the head of the mushroom and three ribbon roots attached to the bottom. It’s a lovely easy pattern and was a great way to use up the odds and ends of some pieces of fabric I had.